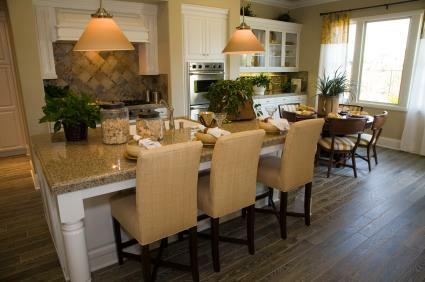 There are many choices available to you as a homeowner for your kitchen floors. If you have hardwood elsewhere in the home, it may seem like a natural extension to continue this wood right into the kitchen. Learn the pros and cons of having a wooden kitchen floor, as well as the best wood to choose for your kitchen before you make the commitment. Like most flooring materials, wood floors also have their pros and cons when installed in the kitchen area. Keep these facts in mind as you make your selection. Additionally, wood floors can be quickly swept or mopped, and don't have grout lines to worry about. Wood rarely permanently stains, so some spilled tomato sauce will not do any lasting damage. Wood floors are not water resistant. A leak in the kitchen sink could result in warping of the boards, which in turn would necessitate a new floor. Some softer woods like bamboo scratch and dent extremely easily. Kitchens are high traffic areas and the floors need to be durable enough to handle constant traffic, frequent scrubbing and dropped utensils and pans. Wood floors darken over time. This is true of every species of wood, and is affected by things like the humidity of the kitchen and how much natural sunlight you get. If you select a floor for a specific tone or shade, keep in mind that it will not stay that way forever. Wood can be expensive, particularly if your kitchen is large or you are trying to match a species of wood to your kitchen cabinets that may be difficult to find, such as Brazilian Cherry. 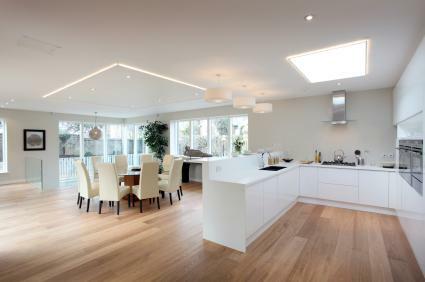 Depending on the style you are trying to achieve, and the amount of maintenance you are willing to do, nearly any type of wood floor is suitable for use in the kitchen. There are a few types, however, that do tend to perform better over the long haul. Ash is a light colored hardwood with a fairly pronounced grain. It can be stained in darker colors to match cabinet colors such as cherry, but one of the things that makes it so perfect for the kitchen is its lighter tone. Dark colored woods show scratches and wear-and-tear faster than light woods. Ash, a light hardwood, is a natural choice for many kitchens. Use it in country, traditional and transitional designs. Carlisle: Specializing in wide plank floors, they carry American Ash wood flooring. Gaylord Hardwood Flooring: They carry ash floors in a wide variety of thickness and stains. Oak is a very traditional, light colored hardwood that shows wear-and-tear much slower than other woods. It has a pleasant variation in color between the boards, and if stained a deeper color shows off a very unique grain that can help to hide dirt. Use it in nearly any kitchen design. Lumber Liquidators: They carry oak in a wide variety of finishes, frequently at lower prices than competitors. Board Brokers: They carry wide plank oak flooring as well as distressed finishes. If you want a quiet looking floor with very little grain, consider clear maple. Maple is a light colored hardwood that can have little to no grain, making it perfect for more contemporary style kitchens. In its natural color, it shows very little wear. Bruce: They carry both clear and country style maple floors. Floor and Decor Outlets: Solid maple flooring in a variety of finishes and low prices. Yellow poplar is a warm colored hardwood with a subtle grain. Even in some of its darker stains, it stays light enough to hide most of the wear and tear on a kitchen. Antiqued varieties are available that can give kitchens an experienced look. Appalachian Antique Flooring: Antique poplar barn boards reclaimed from old buildings. Pennington Hardwoods: Several thicknesses and stains of poplar available. 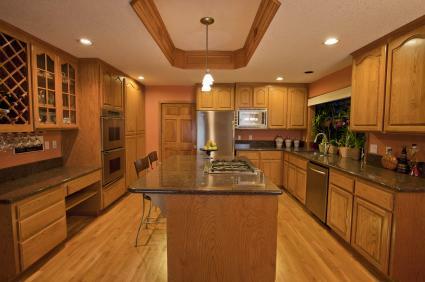 There are several ways to make the decision as to what species and color of hardwood you want to use in the kitchen. Some homeowners make the choice to use one wood throughout the home and extend it into the kitchen, designing the rest of the kitchen around it. Others design the kitchen first, and then need to find a wood floor that suits it. Follow some of these tips to help make the right choice for your kitchen. If your cabinets are white, cream or another non-wood color, look to your countertop to help you find the right tone of floor for the room. Granite, engineered stone and engineered glass counters are frequently made up of multiple flecks of color held in an overall tone. One way to find the right color of wood for your kitchen is to pull a fleck of color such as gold, brown or red and match the floor to it. You can also take the tone of the counter, such as light, medium or dark and find a tone of wood that matches it for a cohesive look. 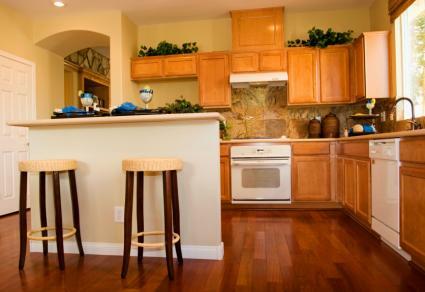 If your kitchen is small, and you have natural wood cabinets, consider matching them with your flooring. Having the flooring color and material extend up the walls creates an optical illusion that the room is larger than it is. If your kitchen is very light or very cool in tone, consider adding a warm, dark floor as a contrast. This anchors the room, grounding the design and setting off the light and cool tones of the cabinets, counter and backsplash. Regardless of the color and species of wood you select for your kitchen, the effect it will have on the overall design is one of warmth and character. Add some of both to your kitchen with the right wood floor and watch the rest of the design come alive.